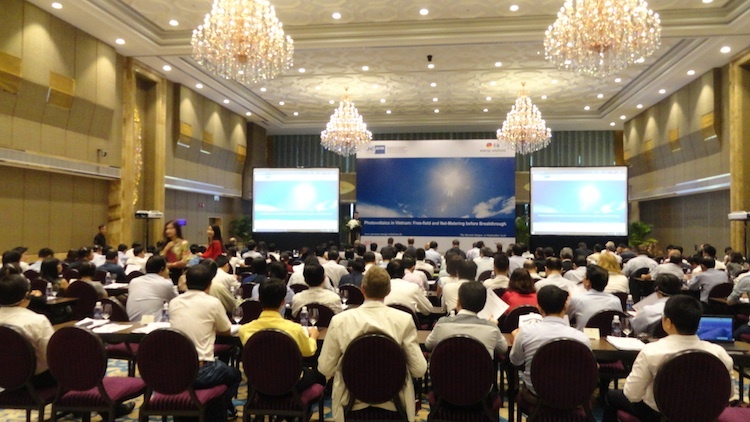 News, Insights and Market Developments from Renewable Việt Nam! Over the last 30 years, Viet Nam has managed a remarkable development of its agricultural sector and its energy sector. Recently, a new challenge has arisen at the nexus of both sectors, involving land-use conflicts caused by the increasing influx of wind and solar energy investments in particular. Viet Nam’s renewable energy resourcesare vast and largely untapped. With the new support schemes for wind and solar energy, around 300 renewable energy projects are currently under development; among them 285 solar projects representing 23,000 MWp of capacity. The large and still growing number of new solar PV investment projects has raised concerns particularly in the Vietnamese “food basket“ provinces in the South with regard to potential land-use conflicts. 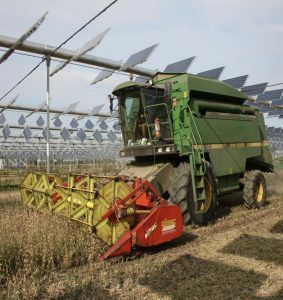 Solar PV dual-use or agrivoltaic concepts can resolve land-use conflicts between energy and agriculture production, by combining both on the same site. Developed in the early 1980’s in Germany, the concept has been implemented in a number of countries with hundreds of (mainly small scale) projects and applications. 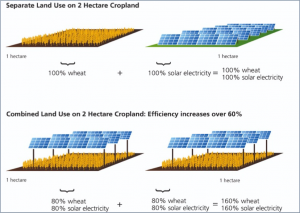 Solar dual-use provides multiple socio-economic benefits that are mainly based on the key concept of the increased land productivity of the combined system, compared to the single-use of the same area of land. The increase of this Land Equivalent Ratio (LER) through dual-use applications has been proven by pilot projects in different countries. This new study commissioned by GreenID Viet Nam analyses international experience with dual-use approaches and assesses potentials of this innovative approach for Vietnam. With the help of a case study in one of the Mekong Delta provinces and based on real agricultural production data from this province, the report assesses a realistic and short-term potential for the application of this innovative approach in Viet Nam. 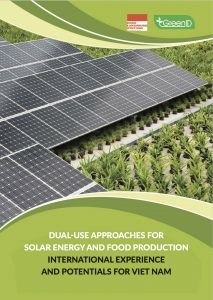 The application of the dual-use concept in a case study for Can Tho shows great potential for solar dual-use. 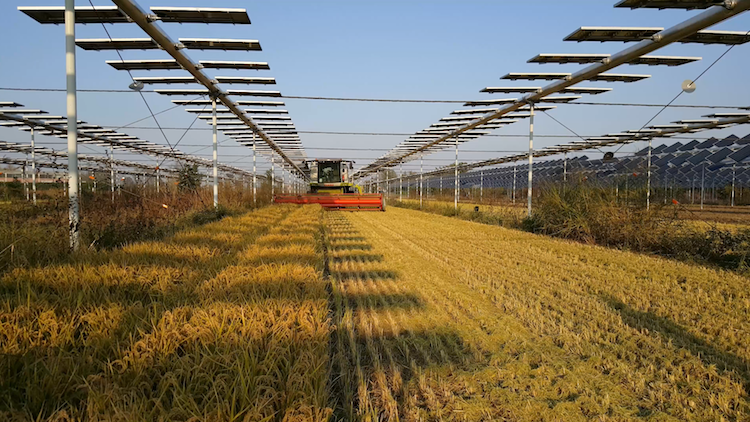 Suitability for solar dual-use (agrivoltaic) applications could be identified for nine agricultural and aquaculture products (rice, corn/maize, soybean, sesame, vegetables, cassava/starch roots, livestock, fish and shrimp). Based on these crops, an overall “realistic”technical potential (as such realizable within the next 5-8 years) could be calculated for Can Tho. Excluding rice production, this potential is in the range of 700 to 1,100 MWp, equaling an electricity potential of1 to 1.5 TWh. This solar electricity generation would cover 46% to 70% of Can Tho’s annual electricity demand. Including dual-use application on rice production areas, the “realistic” potential would increase to 7,500 to 11,300 MWp or 5 to 16 TWh. This amount of clean electricity far exceeds the city’s electricity demand and could thus contribute to the demand of the wider Mekong Delta region and further neighboring provinces. Regarding the costs of solar power from dual-use applications, a conservative assessment was made based on assumptions derived from the limited available international data. According to this assessment, the solar dual-use LCOE are estimated at 9.07 USct/kWh in a base case scenario, with a range between 8.40 USct/kWh (low cost case) and 9.81 USct/kWh (high cost case) and therefore roughly within the range of the current FiT in Viet Nam (9.35 USct/kWh) or about 5 USct/kWh above the current avoided cost tariff for Southern Viet Nam (7.48 USct/kWh). International experience shows that with the dramatically decreased costs of solar PV technology, the growing number of agrivoltaic best practice projects and the development of the dual-use application, this approach is a viable option for Viet Nam to avoid or reduce land-use conflicts related to the increased influx of solar energy investments and the pressure on land owners that comes with it. To develop solar dual-use in Can Tho and Viet Nam in general, the development of a Dual-Use Roadmap is suggested. The most important element of such a roadmap would be the implementation of a Vietnamese solar dual-use pilot project to verify the suitability and potential of selected crops in the local agro-ecological context. Furthermore, a development strategy should include an institutional foundation such as regional Steering Committee or Working Group to integrate important stakeholders, to undertake advocacy work towards regulators or financing institutions and to raise awareness among farmers and other sector stakeholders. The study was commissioned by Green Innovation and Development Center (GreenID), a leading energy & environment NGO in Viet Nam, with funding from Rosa-Luxemburg Foundation Germany. The study is available for download on the website of GreenID Vietnam. Or you can download it directly here. 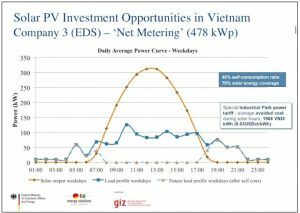 The New FIT/Net Metering in Vietnam – Ignition for Market Boost? On September 12, 2017 the Vietnamese Ministry of Industry and Trade (MoIT) released the long awaited Circular 16/2017/TT-BCT “Regulating Solar Power Project Development and Standardized Power Purchase Agreement for Solar Power Projects“ (please find all relevant documents for download at the end of this post). This final version of the Circular that had been publicly drafted in late April follows the Prime Minister Decision 11/2017/QD-TTg, issued April 11, 2017 and regulates in more detail the implementation of the new Feed-in-Tariff (FIT) and net metering support scheme for solar PV projects in Vietnam. With this Circular potential PV project developers and investors find the binding Standard Power Purchase Agreement (SPPA) that needs to be signed with state owned monopoly utility Electricity of Vietnam (EVN) as well as procedures and templates for the net metering credit calculation and reimbursement for residential and commercial power consumers that install rooftop PV systems. The April draft of the SPPA had drawn harsh critique particularly from international investors but also from domestic market stakeholders due to asymmetries in risk sharing to the disadvantage of the power seller, i.e. the PV investor and system operator. Basically, the international private sector community, organised in organisations such as EuroCham or the Vietnamese Business Forum (VBF), had earmarked the draft as “non-bankable”. The expectations regarding improvements in the final version of the SPPA were not overoptimistically high and – to cut it short – those still existing hopes did not come true. The final SPPA shows only minor changes compared to the draft, some clarifications here and there but the key critical points have not been addressed. The electricity buyer (single-buyer EVN) has to purchase the entire solar power generated from the PV system. The FIT is 9.35USct/kWh (2,086VND), the tariff will be adjusted annually to changing VND-USD exchange rates. Minimum requirement of >16% cell efficiency and >15% module efficiency. Grid connection: Seller responsible for transmission line until connecting point incl. transformer. Principal of nearest connection point (agreed between buyer and seller). The general regulation (Decision 11/2017) has entered into force by 1st June 2017 and will be valid until 30th June 2019 (commercial operation date, COD). The SPPA and further implementation details coming with Circular 16 will enter into force by 26th October 2017. It is required to have an assessment of the impact of the project’s grid connection plan on the local power system. Equipment to connected to SCADA or dispatching system has to be installed in order to provide forecast information on generated electricity by hour to the Load Dispatch Centre in charge of system dispatching. The equity ownership ratio of grid-connected solar power project cannot be lower than 20% of the total investment capital. Long-term land use area of a project must not exceed 1.2 ha/MWp. Rooftop systems shall benefit from the net metering mechanism based on bi-directional metering (meter supplied by provincial power company). The remuneration for excess power is 9.35USct/kWh (2,086VND, same as ground-mounted) and will be adjusted annually based on VND-USD currency rate. Excess power can be transferred from one billing period to the following (“payment cycle”). Remuneration of consisting surplus can be annually or after termination of PPA. Solar rooftop projects (residential/commercial) must sign the rooftop SPPA in form of an appendix to the retail power purchase contract with the local utility/EVN. Details and templates for the calculation are specified in Annex 3.1 (residential power consumers) and Annex 2 (commercial and industrial power consumers with time-of-use tariffs) of Circular 16. The power company is responsible for meter readings, calculation of access energy and revenues of system owner (but system owner is also responsible to check/validate). For rooftop systems <50kWp the Ministry of Finance (MoF) is asked to develop further (tax and fee related) incentives. 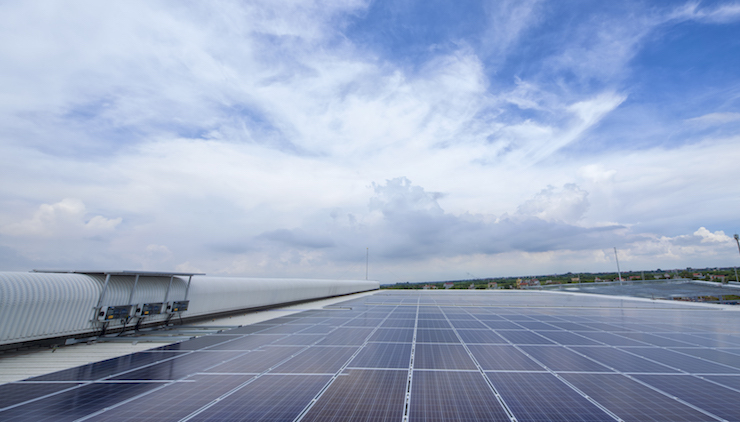 Rooftop systems <1MW have to be registered with the provincial or municipal power company (planned capacity, technical specifications of PV modules and inverters). Rooftop systems >1MW must be included into the Solar Power Development Plan and Power Development Plan and these projects must obtain an Electricity Operation License (regulated in MoIT Circular 12/2017/TT-BCT as of July 31st, 2017). The total installed capacity of the solar power system into the low voltage line of the low voltage transformer cannot exceed the installed capacity of that transformer. Solar power systems, which have a capacity below 3 kVA, can connect to the one (1) phase or three (3) phase low voltage grid. Solar power systems, which have a capacity from equal to or above 3 kVA, can connect to the three (3) phase low voltage grid. The FIT regulation introduced with Dec. 11/2017 is only valid until 30.06.2019 (Art.15.2 and 16.4 Cir.16). To be eligible for the FIT projects have to reach commercial operation date (COD) before 30.06.2019. Comment: This requirement creates substantial additional time pressure on project development and represents a major challenge for all projects that have not reached an advanced development stage by now. The regulation remains unclear regarding the COD reached for “parts of the PV plant”. For power curtailments in these cases that result in not realized power sales there is no obligation for compensation or payments to the plant operator/electricity seller. Comment: The lack of a compensation rule for power curtailments in case of grid maintenance or problems in the distribution or transmission grid creates financial risks that are difficult to calculate and therefore put another burden on bankability. Dispute resolution according to Art.4.5 SPPA and Art.8 SPPA refers to domestic dispute resolution procedures that include domestic Vietnamese courts and the state authorities of the energy sector. The regulation states: “In case the Parties are unable to reach agreement as prescribed above, the Parties have the right to submit to the Power and Renewable Energy Agency) a written request for support the Parties in handling the dispute (Art.8.1 SPPA). (…) In case no agreement can be reached by negotiation: Standard procedure for dispute resolution in the electricity market according to Circular 49/2010/TT-BCTZ, 13.12.2010 (Vietnamese courts and State energy authorities). Comment: The SPPA does not provide for offshore arbitration which has been criticised especially by international investors and financing institutions. The force majeure provisions outlined in 5 SPPA have been criticized to not properly addressing political force majeure that lies in the responsibility of public administrations. Here the final SPPA was adjusted compared to the draft when “decisions of competent authorities” was removed from the catalogue of force majeure events. b) Violence, riots, war, resistance, sabotage, embargo, siege, blockade, any act of war or community hostilities whether war is declared or not. Comment: Although the force majeure provisions have been adjusted the SPPA does not adequately address risks of political change of law and regulations. Considering that the Circular retroactively forces projects that had already negotiated a PPA with EVN before the FIT regulation came into force to obey to the new legislation and renegotiate their PPA according to the new regulation, there remains a risk of political change for any new project implemented on the grounds of this regulation. The SPPA provides only limited compensation for the electricity seller in case of termination/suspension of the contract due to a purchaser’s default or breach of the agreement. The SPPA states: “If the Electricity Seller is the affected Party and selects the suspension of performance of the Agreement, the compensation value is calculated by the value of the actual power output of the Electricity Seller within the previous one (1) year period counted up to the time of suspension of the Agreement performance.” (Art.7.5 Cir.16). Comment: The SPPA provides no termination payment or compensation for the seller’s outstanding debts or expected return on equity capital in case of purchaser’s default. Substantial amendments to the agreement seem to be not possible following Art.10.1 SPPA and Art.18.3 Cir.16. Comment: The provision seems not to leave much room for amending the SPPA. However, the formulation is anything but clear and MoIT officials have already publicly stated that “case by case amendments” could be possible (in this case the official referred to the 1.2ha/MW requirement for ground-mounted PV power plants). Last but not least, one point that is missing in the SPPA and that many market stakeholders were hoping for is a government guarantee for EVN as the sole off-taker of the solar electricity. Comment: Acknowledging that a government guarantee for large solar PV projects would have a beneficial effect on the bankability of the projects it has also to be accepted that not many governments in similar market settings are willing to grant a government guarantee for (still rather small) green power development projects. Further than that, Vietnam has reached its limits of state debts and has not much room for additional debts left. Regarding utility-scale solar PV projects the outlined bankability issues of the SPPA are definitely the biggest challenge for investors. This applies in particular to international/offshore investors and financing institutions that are used to or demand international standard PPA’s. In this regard it was quite remarkable to hear recent public statements from MoIT officials that quite frankly stated that this FIT regulation with the SPPA is mainly addressing domestic investors and financiers to bring the first hundreds or thousands of Megawatts on the ground. For international investors – so the message continued – there could be another chance coming up with the next round of the support scheme (that quite likely could be a competitive auctioning scheme). Apart from that, the question remains if and how the domestic banks and lenders will be able to deal with the risks in the SPPA and the identified bankability issues. So far, public statements from Vietnamese banks were not clear on that. However, the upcoming months will show if and in what extend the huge pipeline of approximately 17 GW of utility-scale solar PV projects will reach financial closure (and get the required licences and state approvals in the first place). Looking at the whole picture shows a reluctant Vietnamese policy maker that is not inviting international (private sector) financing and investors on a large-scale but rather wants to develop the solar market in small steps with (initial) priority for domestic investors. Those local investors (often large and diversified business conglomerates) that oftentimes strive to become project developers themselves in the long run do need international support to design, finance and realize the projects. That for sure is an opportunity for international EPC and consulting companies that partner with companies of the emerging Vietnamese solar industry. 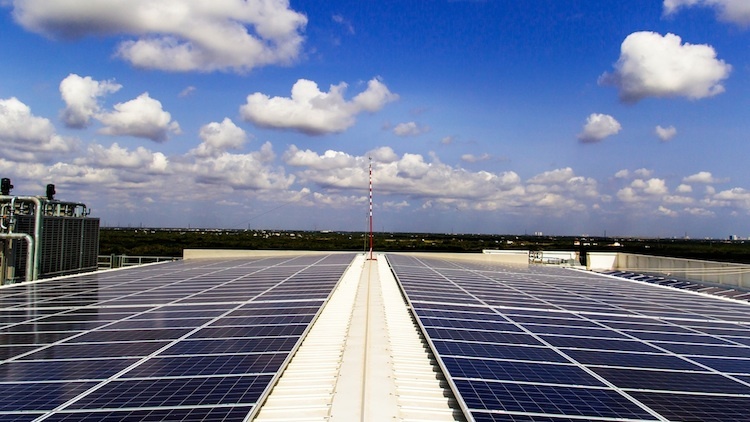 First, there is a large potential in the commercial and manufacturing sector for 100% self-consumption PV systems. With 6-8 years equity payback times in the South of Vietnam and many industry sectors that (at least generally) see added values in ‘going green’ with their production/services apart from potential financial benefits of a PV investment (energy bill savings) there is a good starting point for the development of this market segment. Secondly, the new net metering scheme has the potential to improve those investments cases that can generate surplus solar energy and sell it to the grid. The regulation at least for projects <1MWp seems to be quite manageable but of course, the market has to proof this to be true. On top of that, there is at least some more potential coming with the process of energy market reform. This might bring a competitive power market and an electricity wholesale market that allows access to renewables (at least in the medium-term post 2021/2022) as well as direct PPAs that allow for more attractive business and investment models from the off-taker’s perspective. Presentation by the author on ‘Challenges for Solar PV Project Development in Vietnam’ at the Vietnamese-German Conference on Utility-Scale and Embedded Generation in Vietnam’s Industry HCMC, September 26th 2017. Today, April 14, 2017 the long-awaited decision on the “Support Mechanism for the Development of Solar Energy in Viet Nam” was finally published. The Prime Minister of Vietnam officially signed Decision 11/2017/QD-TTg a few days earlier, on April 11. With this decision Vietnam introduces – for the first time – a feed-in tariff for grid-connected PV power plants of 2,086 VND, equalling 9.35UScents/kWh (20 year PPA). The tariff will be adjusted regularly to changing VND-USD exchange rates. The government will issue a Standard PPA that all power sales have to comply with. The electricity buyer (single-buyer is Electricity of Vietnam, EVN) has to purchase the entire solar power generated from the PV system with priority given to deploy the full generating capacity of the system. PV systems are eligible for the support if and when solar cell efficiency is >16% and module efficiency is >15%. Rooftop PV systems will be eligible for a net metering support scheme (using a bi-directional meter). Excess energy within a billing period (not yet clarified) shall be transferred to the following billing period. Excess balances will be remunerated either after one year or when the PPA is terminated with the same tariff as ground-mounted systems (9.35USct/kWh). This tariff will be adjusted annually according to fluctuations in VND-USD exchange rates. The long discussed system capacity cap for rooftop systems is no longer to be found in the final law. Solar PV investors will be granted various land use fees as well as import duty and tax exemptions. The Ministry of Finance (MoF) is asked to research on and develop additional tax exemptions and other supportive regulations for smaller rooftop systems <50kWp. The regulation will enter into force with June 1st, 2017 and is initially limited until June 30, 2019. Until then, the Ministry of Industry and Trade (MoIT) will assess the law and suggest adjustments for a follow up regulation. PV projects that have signed any PPAs before this decision entered into force are responsible to renegotiate and amend those agreements in accordance to the new legislation. Find here the official Prime Minister Decision 11/2017 on the “Support Mechanism for the Development of Solar Energy in Viet Nam” for download (pdf, in Vietnamese). Find here an unofficial english translation of the law for reference (provided by GIZ Energy Support Programme Vietnam). 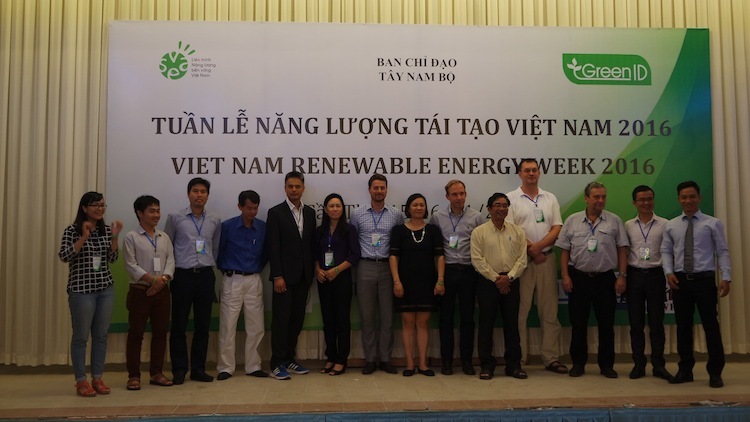 From November 15th to November 19th 2016 the Vietnam Sustainable Energy Association (VSEA) organized the first Renewable Energy Week Vietnam 2016 in the two cities of Can Tho in the heart of the Mekong delta and Hanoi. 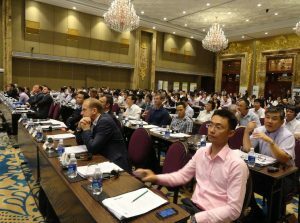 This event aimed to promote public awareness on renewable energy in Vietnam, at the same time to create a forum for multi-stakeholders to debate, exchange on renewable energy policies, market incentives, best practices and the outlook on sustainable energy application in Vietnam in the forthcoming years. VSEA additionally sponsors a series of presentations as well as further workshops and nation-wide side events. 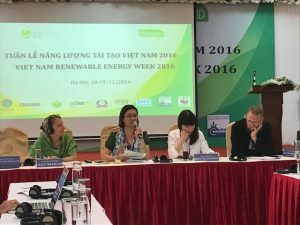 The Renewable Energy Week Vietnam 2016 was supported by GreenID Vietnam, a Vietnamese non-profit organization established under the Vietnam Union of Science and Technology Associations (VUSTA). GreenID’s main objective is to promote sustainable development in Vietnam and the larger Mekong region. 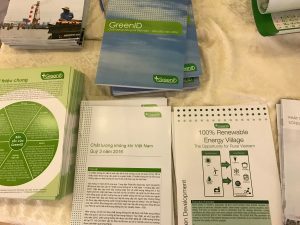 Among many other projects and activities GreenID Vietnam is supporting and managing the Vietnam Sustainable Energy Association. The first half of the event week was focusing on sustainable development in the Mekong region. Consequently, the workshops took place in Can Tho right in the heart of the Vietnamese Mekong delta. 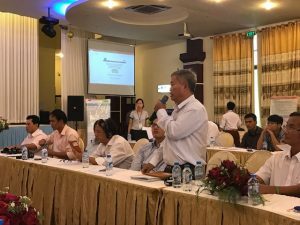 The opening workshop focused on National Renewable Energy Strategy and Security and Sustainable Development Strategy in the Mekong Delta with presentations by WWF, the DRAGON Institute, GreenID as well as representatives from Bac Lieu province. 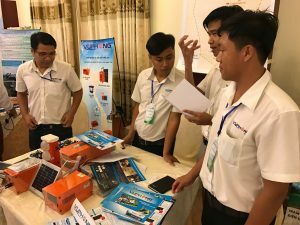 Further workshops explored renewable energy opportunities for off-grid and remote areas in Vietnam. Local expert Dr. Ha Duong Minh from CleanED at the University of Science and Technology Hanoi (USTH) presented renewable micro-grid solutions to supply remote areas and German expert Gerd Ebbinghaus presented a case study and mission report on a renewable energy community project in An Giang province. Further projects and local renewable energy strategies were presented by official representatives from different provinces such as Can Tho, Long An, An Giang and Ca Mau. 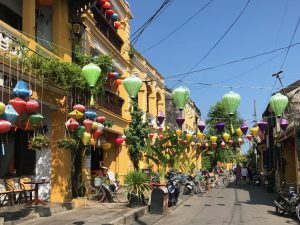 One example was the long-running biogas project of SVN Vietnam that has already supported investments in more than 160,000 small-size biogas plants across 53 provinces in Vietnam. 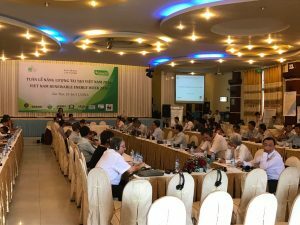 The second day of Can Tho saw further project related presentations on renewable energy and energy efficiency on the national and local level. Mr. Antoine Vander Elst of the Delegation of the European Union presented the EU Support Programme to Sustainable Energy in Vietnam which also includes a project based support for civil society organizations and local authorities. RB Renewable Energy consulting presented results of the GIZ-PDP PV Rooftop Investment Opportunities in Vietnam study that has been conducted from March to October 2016 and includes six case studies for commercial/industrial PV rooftop investments in Central and South Vietnam. 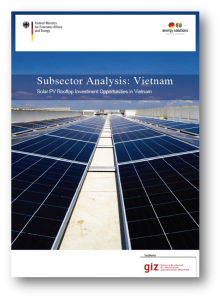 The study identifies attractive investment opportunities in particular for self-consumption business model PV applications for commercial and industrial operations in Vietnam. Those operations pay above average electricity tariffs with day-time peak tariffs of up to 18USct/kWh. Different investment scenarios show equity payback times of 6-8 years for PV rooftop investments in case of good framework conditions. A Renewable Energy and Sustainable Development Solutions Expo rounded up the agenda. Various renewable energy companies as well as development organizations presented their technical solutions and projects. 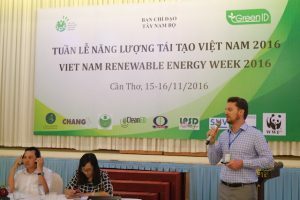 The second half of the Renewable Energy Week Vietnam took place in Hanoi with most of the agenda identical to the one in Can Tho but here attracting a different audience with representatives from the capital’s central government and international cooperation organizations as well as scientific institutions. Additions to the Hanoi agenda were e.g. the presentation of Koos Nefjes on UNDP Vietnam‘s policy work on Greening the Power Mix or the presentation on Social Benefits of Renewable Energies by Dr. Sebastian Helgenberger of IASS Potsdam. A short video of the event can be found on YouTube. If you are interested in the work of GreenID please see their GreenID Annual Report as well as their latest Report on Air Quality in Vietnam. In 2013 the two cities of Wernigerode and Hoi An signed a city partnership, comprised in part of shared common climate change efforts. 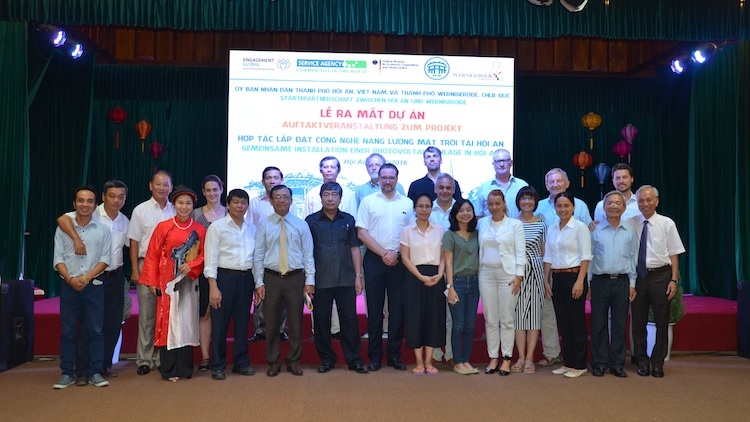 Hoi An participates in the Municipal Climate Partnership project implemented by Engagement Global gGmbH in cooperation with further initiatives and communal associations, funded by the German Ministry for Economic Cooperation and Development (BMZ). The two cities are developing a work agenda for the coming years. In the context of this partnership, the city of Wernigerode has now acquired funding for a solar PV system to be installed on the roof of the city department for culture and sports, right at the entrance to the UNESCO World Heritage old city center. 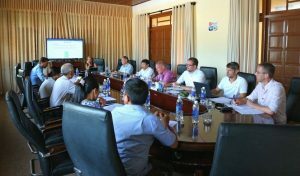 From October 19 to 21 a delegation from the city of Wernigerode visited Hoi An and signed the cooperation contract for the PV system. With an estimated capacity of 38 kWp, the system is expected to support the electricity demand of the center of culture and sports as well as power the public lantern and sound system of the historic city center. To guarantee these consumers continued solar energy supply in the evenings, a certain amount of battery storage capacity will be integrated to the system design. During the visit, a solar installer from Wernigerode, along with representatives from the German city’s communal utility, had the chance to examine the available roof areas, electrical facilities and grid connecting points. RB – Renewable Energy Consulting advised the two parties regarding feasible system designs, accompanied the delegation on their inspections and mutual exchanges, and presented information on solar energy development and framework conditions in Vietnam and Germany. The installation of the PV system is planned for mid-2017. For more information see here (in German). Vietnam has abundant solar resources. The country’s solar irradiation is comparable to most countries in the region, including developed solar markets such as China, Thailand or the Philippines, as well as to international solar markets, such as Spain and Italy. 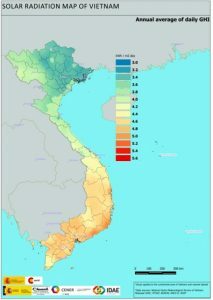 Current scientific estimates state an average of 4-5 kWh/m2/day in most regions of Southern, Central and even some parts of Northern Vietnam (totalling up to 1,460-1,825 kWh/m2/year) and average peak irradiation levels of up to 5.5 kWh/m2/day in some Southern regions (totalling up to 2,000 kWh/m2/year). Deploying this substantial solar potential at production sites would help manufacturing industries in Vietnam improve power supply reliability and reduce the burden on national power demand. This would also help the industrial sector reduce their significant expenses on electricity consumption due to high tariffs during peak hours and cross-subsidization policy from large consumers to smaller ones. And looking at it from the perspective of the solar industry: the long-term market potentials for Solar PV investments in the commercial and industrial sector are generally vast. All economic indicators show that the Vietnamese economy will most likely continue to grow at a rate of 5-6% per year and foreign direct investments (FDI) are expected to increase likewise. Vietnam’s high level of regional and international economic integration is widely seen as a guarantor for further economic growth and the development of the Vietnamese commercial and industrial sector in particular. To make solar PV investment opportunities in the Vietnamese commercial sector tangible, the German-funded Renewable Energy (RE) Project Development Programme (PDP) assigned RB Renewable Energy Consulting to provide an analysis on solar PV investment opportunities in Vietnam, including six detailed investment case studies for commercial and industrial PV rooftop systems. The main objective of the assessment was to identify the potential for rooftop solar PV applications in companies and factories within industrial zones and recommend business opportunities for German companies. The geographical focus of the study was industrial zones and/or private factories located in Central or South of Vietnam with the highest solar energy potential. The core of the analysis is defined by six case studies, with the character of pre-feasibility studies. In general, two different business models were applied in the calculations of costs and benefits: self-consumption and net-metering, which are both expected to be included in the future solar PV support framework drafted by the Vietnamese Government in 2015/2016. The pre-feasibility studies for the six commercial and industrial cases that have been developed in the course of this study show that there are attractive investment opportunities for rooftop solar PV in the Vietnamese industry sector. However, they also show that the current low level of electricity tariffs in Vietnam is a big challenge and the assumption of a future increase in retail power tariffs is a critical factor for investment calculations. For the whole examined company sample, equity IRRs (before tax) range from 5% to almost 18% in conservative base scenarios and from 8% to 21% in the more optimistic scenarios with lower investment costs assumed. Equity payback times range from 9 to almost 18 years in the base scenarios and from roughly 7.5 to 14 years in the more optimistic scenarios and can even get below 7 years when low investment costs and a higher increase of power tariffs are assumed. The results show that there is a divide in results between business sectors that pay the ‘business’ and the ‘manufacturing’ electricity tariffs of EVN. Equity IRRs (before tax) reach double-digit values even in base case scenarios, in those cases that are either paying the EVN-Business tariff or the EVN-Manufacturing tariff but are able to benefit from the net metering support mechanism. In those cases, equity payback times are below or close to 10 years in the base cases. The results also show that the a net metering support scheme as foreseen in the first draft legislation from 2015/2016 would have the potential to improve investment cases substantially for those PV system designs that allow for excess energy generation. This, however, will apply only to a very small number of cases, and hence shows that the legal framework for rooftop applications as proposed would have had only limited impact on the rapid development of this market segment. In the short- and medium-term the key driver for PV investments will thus remain self-consumption and the benefits of power purchase savings. The analysis also revealed that despite the general expectation of investors to reach short equity payback times, there also is an added-value perception of solar PV investments that make longer payback times feasible for many investors. These added values range from benefits for green building certification to contributions to corporate programs, greening products or services in the eyes of customer target groups or the increase of energy supply security. 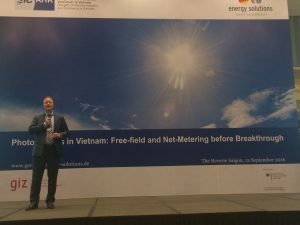 The study was released in the context of the one-day conference Photovoltaics in Vietnam: Free-Field and Net Metering before Breakthrough on September 12th 2016, organized and supported by the Energy Solutions – Made in Germany initiative of the German Federal Ministry for Economic Affairs and Energy (BMWi), the Delegate of German Industry and Commerce in Viet Nam (AHK Viet Nam) and the GIZ Energy Support Programme Vietnam. Read more about the conference here. The study is available for download at the website of the German Ministry for Economics and Energy. Or you can download it directly here. 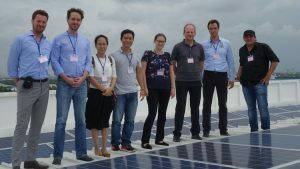 In September 2016, the GIZ Energy Support Programme Vietnam, together with the German Delegate of Industry and Commerce (AHK) organized a business trip for a German solar industry delegation to Ho Chi Minh City to build up German-Vietnamese networks as well as boost investments and project implementation in the sector. Starting with the one-day Photovoltaics in Vietnam: Free-Field and Net Metering before Breakthrough conference on September 12th, the German solar companies presented their products and services to over 200 participants from industry as well as federal and provincial political administrations. Representatives from local Vietnamese companies (Viet Linh, SolarBK etc.) also shared insights into the local solar sector. Private sector representatives from both countries concluded that the three requirements to foster solar power development in Vietnam are: a suitable FiT and supporting legal-administrational framework, project financing at affordable interest rates, and public acceptance and support. A site visit to the DBW Garment Factory, one of the latest commercial PV rooftop projects and a best-practice example of German solar PV technology in Vietnam, rounded up the week. Read more about the conference and German-Vietnamese investment cooperation in the solar sector in the October edition of Vietnam Investment Review (download pdf) or on Vietnam Economic News (14/09/2016).